More than 27 million small businesses exist across the United States – 1.5 million of those do not work for profit. For these businesses, the goal of getting revenue is how much they can contribute back to their cause, whether it is feeding the hungry, housing the neglected, helping victims or spreading a message. The directors of many of these non-profits barely pay themselves a fraction of the revenue they work tirelessly to raise. For all of the love and hard work philanthropists put into their businesses, PaySimple is dedicating February, the month of love, to Philanthropy. 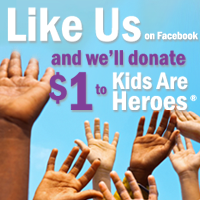 As part of our month-long campaign, for every person who likes our Facebook page, we will donate $1 to Kids Are Heroes®, a non-profit that empowers, encourages and inspires children to become future leaders in volunteerism and community involvement. In addition, throughout the month of February, we will be addressing the unique challenges that non-profits face on our blog with expert advice, insights, and events to help non-profits add efficiency and even increase fundraising in their day-to-day operations. So support our future philanthropists with Kids Are Heroes® by liking us on Facebook, and then check back here throughout the month of Philanthropy February for more on how to support non-profit success! 1Offer eligibility for FEB4LIFE promotion based on user having a non-profit business. PaySimple reserves the right to cancel, revoke, or otherwise prevent the issuance of the account if there is any suspicion of fraudulent and/or misuse of this offer with or without notice to the parties in question. Offer expires on 2/29/2012 at 11:49pm MST. Other restrictions may apply.